Based on the recommendations on this site, my hubby and I decided to leave Atlantic City NJ - where we're visiting and usually find lots of beach glass - to see what we could find an hour and a half away at Fortescue Beach, NJ...and all I have to say is WOW! Over the course of an hour, at high tide(less than ideal conditions) we found the most ridiculous amount of nicely tumbled glass we have EVER found - and we've been to beaches all over MD, DE, NY and NJ. I'd highly suggest visiting if you want a non-stop, super-successful trip. The map shows that this beach is in a bay that likely does not get enough wave action to produce much jewelry-grade sea glass. On a daytrip to Cape May, NJ, we decided to take a detour to Fortescue...on the downside, it was all green, brown, and white with one tiny piece of cobalt blue (see pictures). I went to Fortescue on Mother’s Day, May 13, 2018 with my husband and my thirteen year old daughter. I’m glad there wasn’t any green heads. The last time we went in the summer a few years ago we were swarmed with the flies so we didn’t really get out on the beach. I did find some sea glass. Some brown, green, clear, and a couple of small aqua blue pieces. I want to go back before summer and gather more. We were only on the beach around 45 minutes but I love the collection I found and my daughter found some cool stones also. 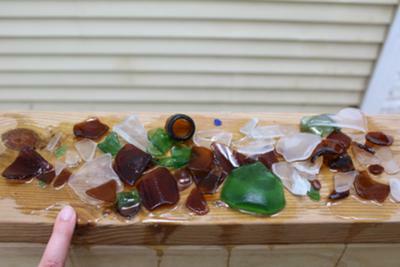 "This small fishing town is the MOST amazing place to find seaglass. My boyfriend and I spent about 5 hours total collecting on the beach and we filled two regular sized plastic shopping bags. We found tons of different colors ranging from pink to the usual browns and greens. I highly recommend any avid collector to go and check this beach out!" I found hundreds of pieces on the beach today around noon. 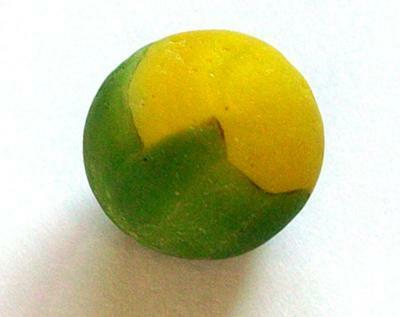 Many were not weathered, but there were literally pieces to be found in every step. I found one rare dark aqua and a nice large piece of peach colored glass. I do have a photo of the entire lot collected. We would love to have more photos of Fortescue sea glass. Can you submit some photos that we can add to this page? i do not know what you use the sea glass for but i live down the street from Fortescue and go there often with my 2 girls. Every time we go there we come back with a bag full of sea glass the the kids pick up. I have plenty of it. I drove to Fortescue Beach on July 20 based on the recommendations on this page and found plenty of sea glass (filled a Ziplock bag in an hour), mainly brown, green and clear but also some aqua and one piece of mauve. There are some nicely tumbled, frosted pieces but also lots of bigger chunks that aren't "done" so you can be choosy. Not a lot of jewelry-quality pieces but this is a beach where you will be pretty much guaranteed success if you just want to find some glass to display in a bowl or want to explore a beach that is remote and not commercialized. Don't be surprised to see lots of horseshoe crabs as Fortescue is part of a major breeding habitat for them. They can't bite or sting you even though they look scary. If you see one washed ashore and turned on its back, please gently flip it over so it can make its way back into Delaware Bay. Thankfully, there were no biting flies the day I went, maybe because there was a strong breeze off the bay. This beach is loaded with glass but it's not frosted and its chipped. Some very large pieces. Mostly brown, green and clear. My bf found one beautiful skinny shard that was perfect! This was our first time hunting for seaglass. I look forward to trying to wire wrap it for a pendant for myself! Omg it was so much glass! Bugs were mild July 7th. I visited Fortescue today at low tide and found an unbeatable selection of sea glass. This was totally worth the drive. In two hours I found over 30 great pieces and other people had full Ziploc bags! Does anyone know if the Shore beaches are open? Sandy Hook or Fortescue after Hurricane Sandy? I have been there twice with my daughter lizzy, summer 2012, area is rather remote to get to, but the finds are fabulous! Majority of the pieces which were large, were, green white and brown, I did find pale blue, mint green and a few pieces of cobalt blue. In an hour, we had a large plastic bag full, was NOT disappointed at all! Found a gallon size ziplock bag in less than 2 hours at low tide. A lot of brown and clear glass, some green, some light blue and 3 tiny pieces of dark blue. Went on a warm day in October and there were no flies at all. It's an okay place to go. Found WAY more the next day in Lewes though. Most all are brown, green and white. A few were nice..mostly broken and not tumbled though. Those flies ARE a bugger...OUCH! Very quite beach...except for a few fishermen. Some were a bit "rough" looking but nice enough. I recently visited Fortescue in Aug 2012. I was so excited that there was a beach near me with such a great review. Yes there is a lot of glass on the beach, but it's more like raw shards that will cut your feet if you step on them! It seemed as if all the cottage windows broke and were swept into the sand. A lot of the glass we came home with was barely tumbled, only white and brown, and quite thin. We went at low tide, even digging in the sand, but I was kinda bummed with the results. We were just in Fortescue and also found some sea glass there. I picked up about 40 pieces in no time. I would say about 10 or so weren't keepers. We had a awesome day at Fortescue! there is so much beach glass! i found my first pink piece! We left with a large ziplock bag and left tons behind.i can't wait to go again!!! We went on a detour from Cape May to Fortescue. 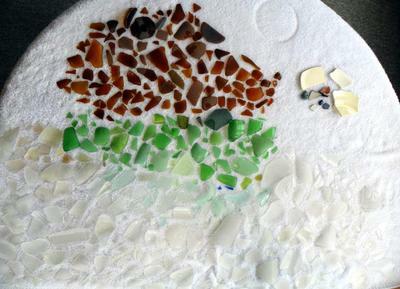 Tons of seaglass, true, but only found green, brown, and white with one tiny peice of blue. There are these huge flies, called greenheads, that bite and it really stings. They attacked our car and my family when we got out. I had to wrap up in a towel, pants, and a hat just to spend 15 minutes on this beach and my family had to stay in the car. There is no beach pass and it's very secluded. I think I would have found more had I been able to stop walking long enough to do a thorough hunt. Those flies where relentless, though, and very agressive. Read online to go in fall (Sept) and to go early in the morning to avoid them. we went two weeks ago!!! there was so much sea glass you can be choosey!! we found a big bag full.alot of white and green.we found one piece of pink,some blue even yellow! and a few pieces of pottery! cant wait to go again! hi we have made a B&B reservation for two days,because we read a comments sent in by Lin. she said, she found a large amount of sea glass at Fortescue , nj!beach! we cant wait to get there!!! we also hope to meet Lin&Dave!? if you see this and if you like please get in touch with my husband and I! Hi Lynda! 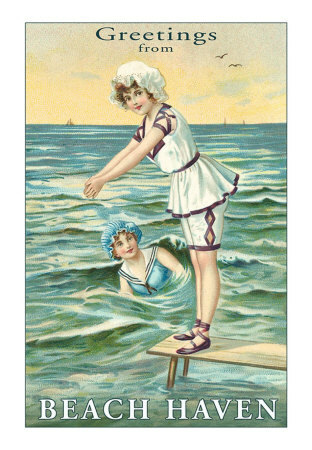 Nice to hear from you, but... it wasn't our Lin that posted about Fortescue beach. Lin and I here at Odyssey have no first-hand knowledge of this beach. Please read the comment below before making a decision. We would hate for you to be disappointed. From the various reports on our site here, we see that there have been some good finds reported. But we also see that a LOT of the glass found at Fortescue is not very rounded or tumbled. Lin and I (David) are living temporarily in Washington State and will be back in N. Peru in a few weeks, so we have no opportunity to check on Fortescue beach ourselves. Beaches also change from day to day. Sand shifts a lot and can cover/uncover sea glass. Keep all this in mind... and let us know how it goes. Be sure to take photos and send them in! 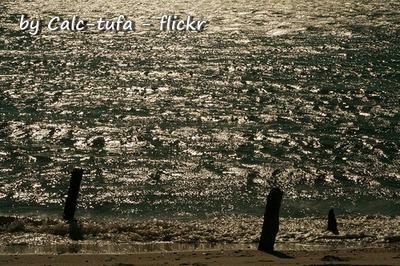 After reading the comments on the great finds at Fortescue beaches, I was very disappointed. My sea glass loving friend and I set out in hopes of finding our treasures. Maybe, 4 pcs of brown that's it.